A unicorn costume? A pregnant Beyonce team-up? A political protest staged in shimmering sequins? We didn't know what to expect from Lady Gaga's first Super Bowl halftime show, but we knew it'd be flashy. Turns out it was also state-of-the-art. To kick off her outrageous performance at Super Bowl LI, Gaga scaled NRG Stadium in Houston and belted the opening bars of "God Bless America" from the fulcrum of the open roof. That would be enough for a lesser pop star. 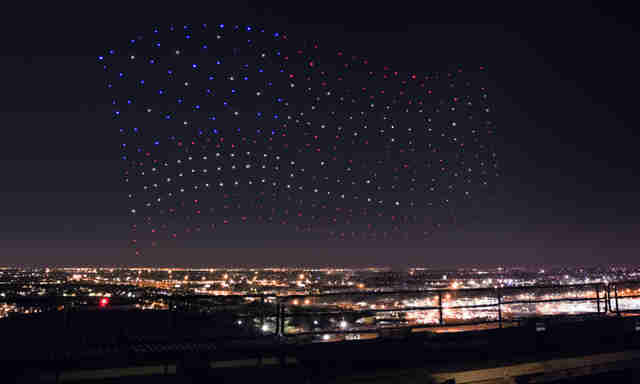 But as Gaga hit the high notes, a fleet of LED drones lit up the sky, creating a background of faux-stars that transformed into the Stars and Stripes with no interruption. The wizardry behind the sight was so mesmerizing, one could almost miss Gaga plummeting to the bottom of the field on steel cables. Almost. Gaga's own kickoff was a visual and technological wonder. According to a making-of article on Wired, each drone measured a foot long square, weighed eight ounces, and sported a plastic and foam body to ensure that, if one happened to drop out of sequence, it didn't cave anyone's skull in. Along with being optimized for mobility, the drones are capable of organizing into four billion color combinations at the push of a button. Gaga chose red, white, and blue in a few recognizable patterns. America! As Wired details, this was a logistical feat. Not only did the drones have to be programmed to fly in pattern, organizers of Intel's "Shooting Star" program had to work with local government to secure rights to launch them at the required distance. An The Federal Aviation Administration prohibits drones from flying within 34.5 miles of NRG Stadium. But patience (planning for the stunt began in early December) paved the way for an FAA dispensation. Anything for Gaga glamour. The rest of the halftime show was business as usual for Gaga: a fabulous cavalcade of diamond dresses, star wands, shoutouts to mom and dad, the supreme power of the keytar, and impassioned words on diversity. Gaga wasn't overtly political in her show, but her chosen snippet from "Born this Way" ("No matter gay, straight, or bi, Lesbian, transgendered life / I'm on the right track baby, I was born to survive") was enough to light up social media with praise... and a ton of SpongeBob memes. But nothing shocked and wowed quite like the opening bit, a stunt that would leave Elon Musk and Tom Cruise impressed. Before and after, Gaga didn't seem fazed by the sheer scale of her musical touchdown. This one was still for the fans.